The CNC machine turret of two directions by two servo motor drive, so it's short transmission chain. Without the use of gears, transmission parts such as light bars, with the servo motor connected directly with the lead screw driven turret movement. Servo motor can also be synchronized between the screw belt or gear coupling vice. multi-function CNC machine is a DC or AC control unit to drive the spindle axis, according to control instructions fo the CVT, the spindle between the need to use to carry out multi-stage gear speed. To expand the speed range, now g enerally but also through a gear in order to achieve sub-variable speed, even so, the bed inside the structure has been much simpler than conventional machines. Another CNC machine structure is characterized by stiffness, which is for high- precision control and control system to match, in order to adapt to the high-precision processing. CNC machines structural characteristics of the third light drag. Generally use the ball screw moving knife. Ball scre CNC machine is one of the key mechanical components, ball screws installed at both ends of the rolling bearing is dedicated uranium, its pressure angle than the commonly used angular contact ball bearing units is much greater. 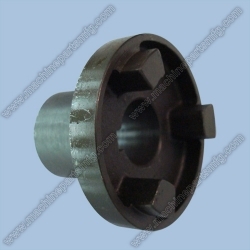 This special bearing paired, is optional, is the best pair of bearing factory. In order to drag the light, CNC machine lubrication are more fully, most of the automatic use of oil mist lubrication. The higher the price of CNC machine tools, control system, longer life expectancy, so the CNC machine slide rails also require good wear resistance. CNC machine commonly used set of steel rails, precision machine tools to keep this relatively long period of time, many of its service life is extended. CNC machine parts also has fully cooled, the more rigorous protection features, automatic operation in general are in closed or semi-closed state. CNC machine generally comes with automatic chip conveyor.